Did you lose your car keys? There’s no need to be angry, as our Licensed Locksmith in Charlotte will expand upon below. Your car keys might have gotten misplaced, broken, worn out, or stolen. Either way, you can’t use them and they need to be swapped out for new ones. We understand how frustrating it is to have your car keys replaced. Asking your dealership to replace your lost keys can be very expensive. Car dealers also require you to have your vehicle towed to their garage, and not only will you have to spend extra on the towage, but you would also be charged an unjustified amount just to replace your own car keys. It can be both expensive and frustrating, mainly because replacement keys require a higher level of car rekeying programming techniques and skills so that the chip key will be read by the ignition. It is unfortunate indeed that many car dealerships do not hire locksmiths or key technicians to work in-house. They have to outsource the job, which incurs more expenses for them and also consumes more time. This expense in-turn falls on your head. No wonder replacement keys through dealerships take a day or two! Are you mad as hell and not going to take it anymore? Good thing the best Charlotte Locksmith A-Access Lock & Key has got you covered. Our services are offered at very reasonable prices, including lost key services, replacement car keys, and ignition key replacement. We are mobile locksmiths that come to you in our trusty van, so you won’t have to have your car towed. We make new keys on the spot and can give you your replacements in no time at all. Replacement car keys are among some of the services we offer. If you can’t find your keys and need a new key made then give us a call (704-545-5410). We come to you! Every single one of our Charlotte locksmiths is highly skilled and professional, and we specialize in emergency situations involving lost automotive, residential, and industrial keys. 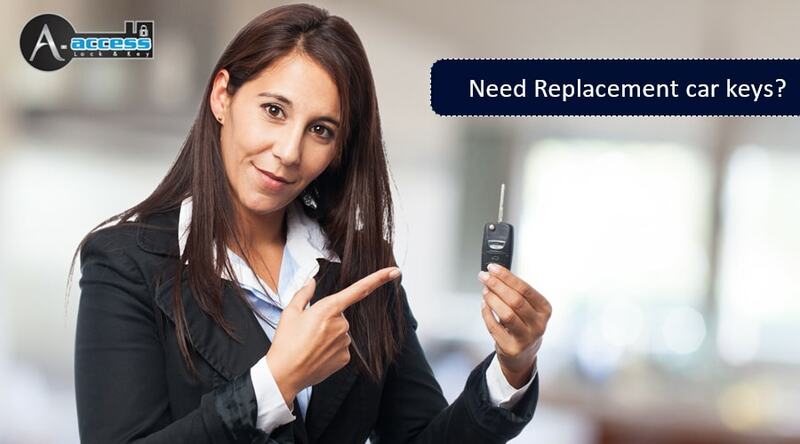 Do You Require Replacement Car Keys? We got you covered! At A-Access Lock & Key, you need not worry about lost car keys. Our team makes new ones on the spot, quickly and efficiently! We are well known in Charlotte as one of the best locksmiths there is because we are efficient, we are fast, and we are pros. Call us at 704-545-5410 for your lockout and lost car key emergencies and we will send across our top Locksmith in Charlotte to service you. A-Access Lock & Key offers a wide variety of auto locksmith solutions that go beyond just car key replacement services. Our team is equipped with the most advanced key cutting machines and rekeying tools, to bring you the best locksmith services in Charlotte. If you have a broken car key, lost ignition key, or require extra keys for your car, you can rely on A-Access Lock & Key. Our expert technicians have years of experience, are fully trained, licensed, and insured. Trust A-Access Lock & Key. We are the key to your security! Call 704-545-5410 right this instant! Acquire Replacement Car Keys via our Expert Locksmith services! Keypad Locks: What Are They and Why Do You Need Them?